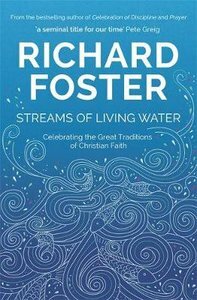 Foster's celebration of the spiritual life incorporates history's most significant Christian figures and movements and argues for a rich, well-rounded faith, free of constricting labels. About "Streams of Living Water: Celebrating the Great Traditions of Christian Faith"
Richard J. Foster (D.Th.P., Fuller Theological Seminary) is founder of RENOVARE in Denver, Colorado. He is the author of many books, including Celebration of Discipline: The Path to Spiritual Growth, which has sold over two million copies worldwide, Freedom of Simplicity; Streams of Living Water, and Prayer, which was Christianity Today's Book of the Year and the winner of the Gold Medallion Award from the Evangelical Christian Publishers Association, and is a general editor of The Renovare; Spiritual Formation Bible. His most recent books are Life with God; Longing for God with Gayle Beebe and Sanctuary of the SoulJourney into Meditative Prayer.